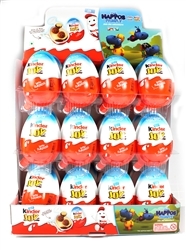 Kinder Joy by Ferrero chocolate company is an Egg shaped plastic container that splits into 2 pieces. One side contains layers of milk cream and cocoa, and the other side contains a surprise toy. There are 2 versions of Kinder Joy available, Kinder Joy for boys and Kinder Joy for girls.